Masuren, or Mazury, horses are an extinct breed of horse from Poland. They were once a very notable breed and was a quality riding horse. Mainly they were developed from Trakehner horses, and crossed with Pozan horses. Masuren horses were bred at the stud at Liski in the Masuria region. 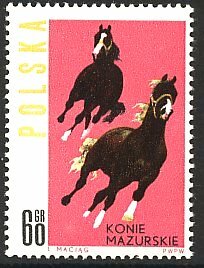 In 1963 a Polish postage stamp showing a Masuren horse was issued.